Well I really don't know what more I can say about the products; because for me it's done a wonderful job and I'm planning to place a big order soon so I can keep using them. 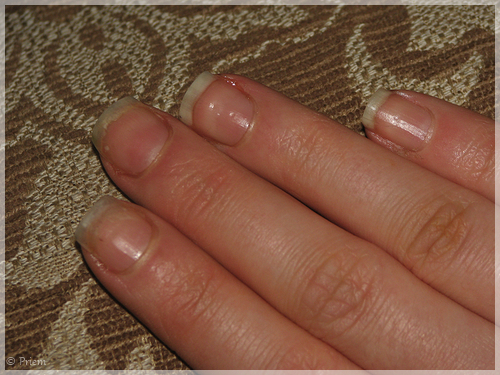 My nails grow much easier; but I don't keep them too long. 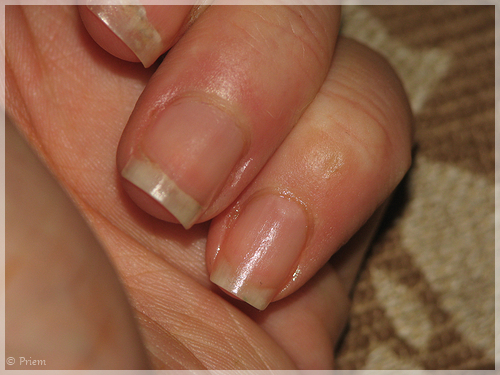 They are very strong and my cuticles - which I could never leave alone - are looking so much healthier. I rarely bite them anymore which is a BIG improvement before I started the challenge. My products are almost empty though; so I don't know if I can make it the entire 10 weeks. 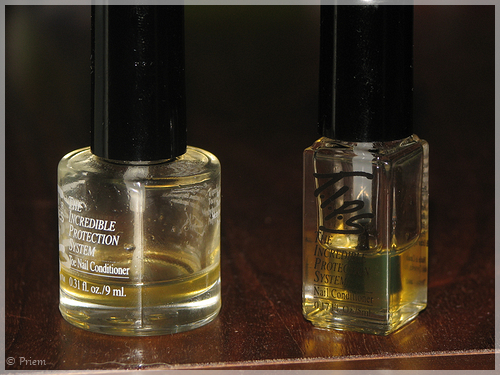 So I will update my blog soon with some regular nail polish swatches. 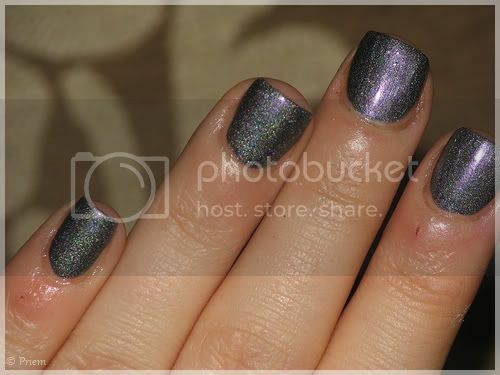 I will also post pictures of my possible wedding mani's; so stay tuned ! Week 6 already !! Whooooo ! It's really going quicker than I thought it should hehe. Although I can't seem to get used to my naked nails... Anyhow. My bottle of TIPS for toes is álmost at the bottom. 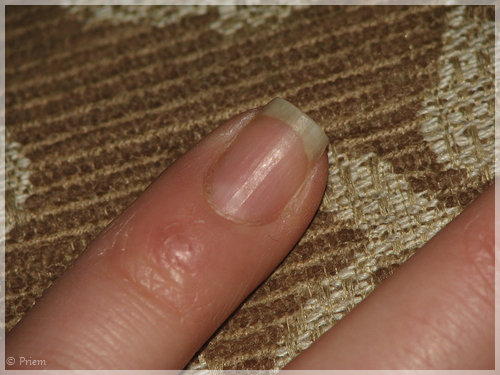 My bottle of TIPS nail conditioner is at the half. If I finish them; I'm definitely buying more hihi. I'm convinced about the products and it does a wonderful job. NOOOOOO ! I can still hear myself screaming hahaha. Ow well; just filed it back and that's it. 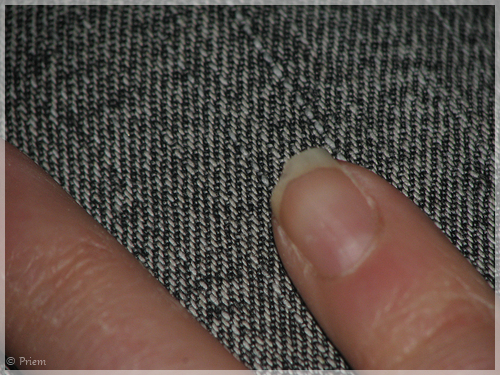 I really thought I ruined my nail completely; but it was just a bit at the top. My cuticles look a lot better !! Although I'm still not there; but that's not a shock. 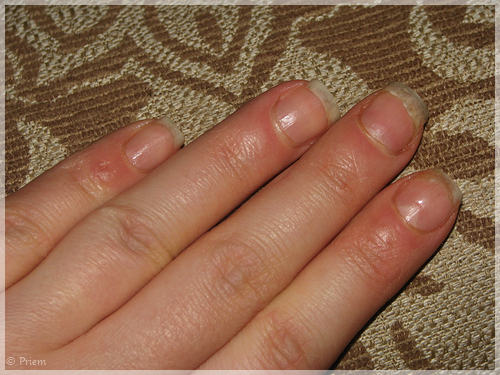 When I stopped biting my nails a few years ago; I could never stop biting my cuticles. This is the first time that I can leave them alone for more than just a few days. Whaaa I feel sorry already... After 5 weeks of naked nails; being really strict with the ASK bare naked challenge; I broke it and polished my nails today *ashamed*. It's sunny and beautiful weather; it just screamed of a holo polish. So yes I polished my nails... I'm going to take it off tonight and I know it's not terrible to polish the nails during the challenge; but when I start something I'm always trying to follow the instructions as it should. I just really really really wanted to polish my nails haha. Bad excuse.. I know. I just love A-England polishes. It was untried for about 5 weeks now (I received them júst when I started the challenge lol); but o so prettyyyy ! This was 2 easy coats without topcoat. I just can't stop staring at the holo goodness with flashes of pink! Hi everyone ! Ugh I'm a little late for my blogpost; sorry about that :( I had a very hectic week due to some wedding stuff we had to take care of. We received our invitations and I really wanted to post 'em out this week; so every evening after work; I was busy with folding them and writing down the addresses. Waw I didn't realize that took sooooo much time. 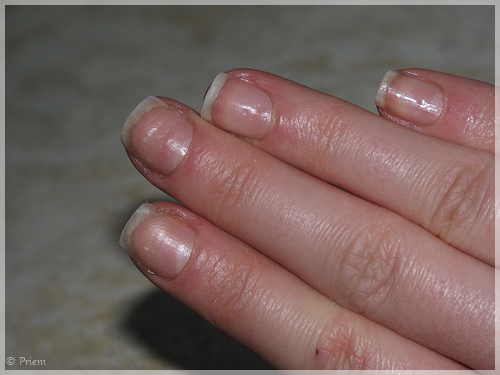 The routine I use is as followed: Get up and first I apply TIPS for Toes to my nails. I shower and get myself ready. 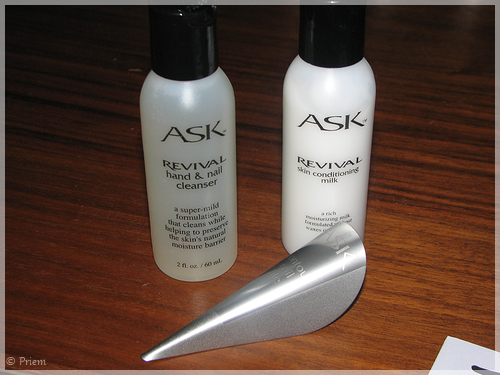 Eventually washing my hands with the Ask Revival hand & Nail cleanser; and after that rubbing my hands with Ask Revival Skin conditioning milk. 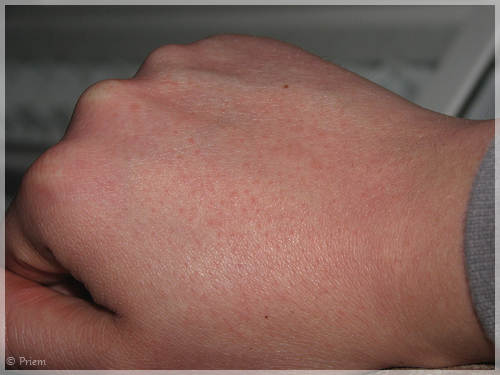 During the day; when I've been outside a lot or when it's really really cold and my hands get really dry; I apply the skin conditioning milk again. The products: There is a reason why I postponed the review for a week... About a week and a half ago I noticed my hands kinda felt dry. 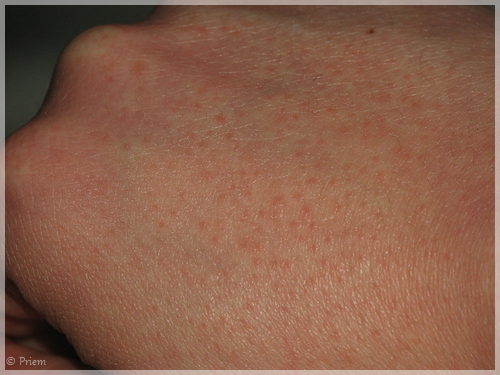 When I took a closer look I saw some redness apear. I haven't used any other hand products; but I can't tell for sure if it's cause of the products and wanted to use the products more intensively so it might get better. My hands have little bumps on it. It started last week but this week it gotten worse. I really have no idea what it is; because it doesn't itch or anything. It feels.. bumpy ! I will contact Lisa and ask her what I can do about it. If it's possible that I could be allergic to one of the ingredients? Other than that I'm pleased about the products. It moisturizes my hands and it has a nice subtle sent to it. 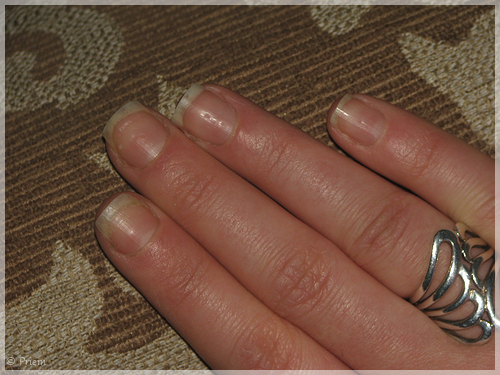 It's so weird; because the nails products really do a wonderful job for me! I'm so happy about the progress. I file them every day and make sure I follow the procedure as good as possible. Even my cuticles look a lot better already ! 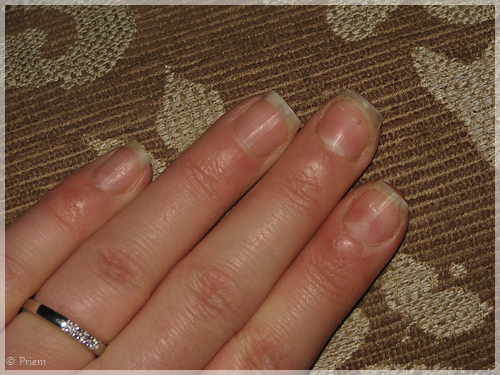 Next week I'll make a summary about the progress so far and will put the pictures together so you can see what 5 weeks of using the products did to my nails. 2012 © Priem. Ethereal theme. Powered by Blogger.